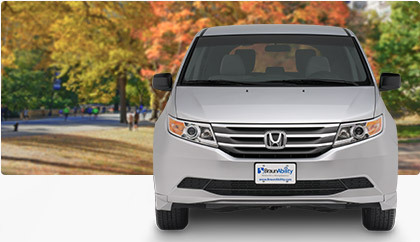 Drive-Master offers Side Entry Wheelchair Accessible Van Conversions for the Honda Odyssey with BraunAbility and VMI Vantage Mobility. Below are all the different Honda Odyssey Side Entry Minivan Conversions we offer. With its athletic exterior lines and a refined interior finish, you’ve never seen an accessible vehicle like the Honda Odyssey Power. The engineers behind BraunAbility’s newest conversion call this a “lightning bolt” design, and it’s easy to see why. The lines of our stylish ground effects blend seamlessly with our new step flare design, cutting a sleek and modern contour. The Honda Odyssey Northstar wheelchair-accessible minivan delivers both space and style with generous headroom, more floor length and a top-rated design. The ramp is stowed below the floor, offering a clean, obstacle-free interior and greater safety in the event of a collision. The Honda Odyssey Summit conversion van accommodates both manual and power chairs with a durable, fold-out ramp, complete with the safety of high side rails. With obstacle-free interior space, plenty of headroom and additional floor length in the rear, this wheelchair-accessible van provides room to maneuver.